LAHORE: Lahore High Court (LHC) has summoned PTI Chairman Imran Khan, PAT leader Dr. Tahirul Qadri and AML chief Shaikh Rasheed for Tuesday in connection with similar petitions against holding of ‘Azadi March’. 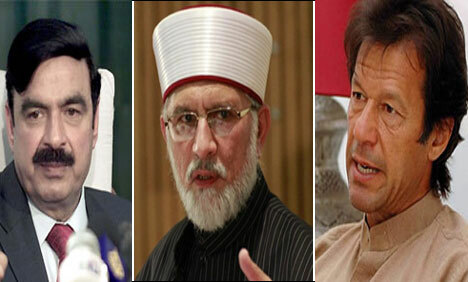 Taking up petitions filed against the staging of ‘Azadi March’ in Islamabad on August 14, the LHC issued an order in writing directing Pakistan Tehreek-i-Insaf Chairman Imran Khan, Pakistan Awami Tehreek leader Dr. Tahirul Qadri and Awami Muslim League chief Shaikh Rasheed Ahmed to appear before the court tomorrow. President Pakistan Muslim League-Q Chaudhry Shujaat Hussain and former chief minister Punjab Pervaiz Elahi have also been summoned for tomorrow. PTI Chief Imran Khan and PAT leader Tahirul Qadri are gearing up to stage their ‘Azadi March’ and ‘revolution march’ respectively on August 14. Imran Khan’s rally is focused on registering its protest against the alleged rigging in May 11 general elections while Tahirul Qadri wants to change the system through what he calls a ‘public revolution’. Shaikh Rasheed has put his weight behind both the agitation movements.